Birgit Koenigsheim, head of Care Advanced Services and MD for Nokia Germany GmbH, explains how and why women from around the world participating in Nokia’s annual ‘Our Greenhouse event’ in Munich became ”social butterflies” on 17 November 2016. We don’t think twice about interacting with somebody on the other side of the planet – whether talking directly, by email or through a social media network. And as we know, networking can bring great opportunities in our professional and social lives. Such networking is especially important in encouraging women to take up and advance their careers in the science and engineering (STEM) sectors, which is essential to achieve a 50/50 gender balance in employment. In our increasingly digital world, expanding our portfolio of connections is easier because we can reach out to more people. Yet how do we know we are making the right connections? An app that provided insight into the possibilities of digital matching for like-minded women took center-stage at the recent ‘Our Greenhouse’ event, which aims to support high-potential women. The smartphone app, created for the event, is called ‘Social Butterfly’ and brought a game-like approach to the serious topic of women’s networking. It works by matching similar profiles so like-minded users could connect and message each other directly. This is one way to show how we are fostering digital initiatives that help increase collaboration and encourage risk taking so that we can help spur the greater digital transformation progress. The Nokia-sponsored event ‘Digital Leadership – how women shape business’ featured a keynote speech given by Anna Kopp, CIO of Microsoft Germany, courtesy of the WOMEN SPEAKER FOUNDATION. “Our world is moving faster every day. We have to find creative ways to manage the load we are confronted with. It is about simplifying, challenging old ways and being courageous enough to just start doing it. Our Greenhouse is a valuable forum for women to share experiences and strengthen each other to find this courage,” said Kopp. A lively panel discussion followed with influential women in leading companies and organizations including Pamela Maruschke, Managing Director at Accenture Germany; Claudia Breunig, R&D at MondelÄz International; Emma Mohr-McClune at Current Analysis; Stefanie Neubeck at Synetz International; and Sonja Zollner, Member of the Supervisory Board for NSN GmbH & Co KG at Nokia. 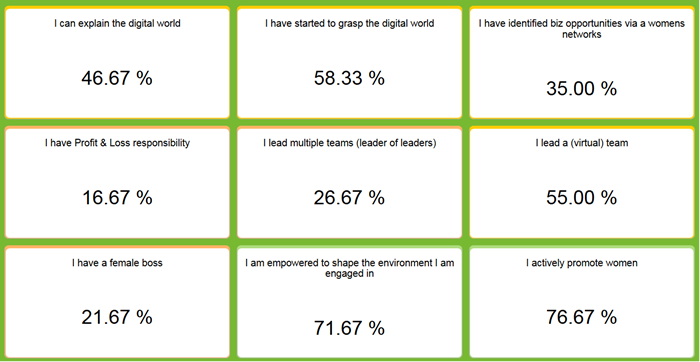 Digital leadership is becoming essential for all organizations. We are today seeing the rise of Chief Digital Officers or CDOs, joining boardrooms alongside more established CIO, CFO and COO colleagues. The CDO is tasked with driving growth by converting traditional businesses into digital ones. Essentially, the role involves looking for business opportunities that have been enabled by the digital revolution. It also looks at customers and how their needs change as technology develops. The event reflected this new reality by focusing on how improving our digital presence as women shows that we have taken our place as digital citizens and understand the issues and opportunities of the new digital economy. Gaining more from the diversity that women can bring to their workforce is a clear success factor for companies that want to invest in the future. True transformation to the digital world can only come when the entire organization is aligned to the cause. Events like “Our Greenhouse” help ensure that we women support each other to bring our potential and diversity fully into the digital workplace. Nokia is moving strongly to the digital economy, forging a new relationship with customers based on providing everything as a digitally accessed service and doing more business online. We are also enabling our staff to work more flexibly and efficiently using online services that can be accessed anywhere from any device. Technology can simplify our lives, making time for the important things in life. It opens new horizons to make us feel good about what we bring to the table and what we will one day leave behind... while making our businesses more successful. ...And it’s future bottom line enhancers in the workplace. Birgit is MD for Nokia Germany GmbH and heads the Care Advanced Services for Mobile Networks, propelling the business forward in the digital Customer Care space. As an electrical engineer and proud founder of ‘Our Greenhouse’, an organization to support high-potential women at Nokia and its ecosystem, Birgit is passionate about promoting women into the “New Normal”.